Q: And Babies? 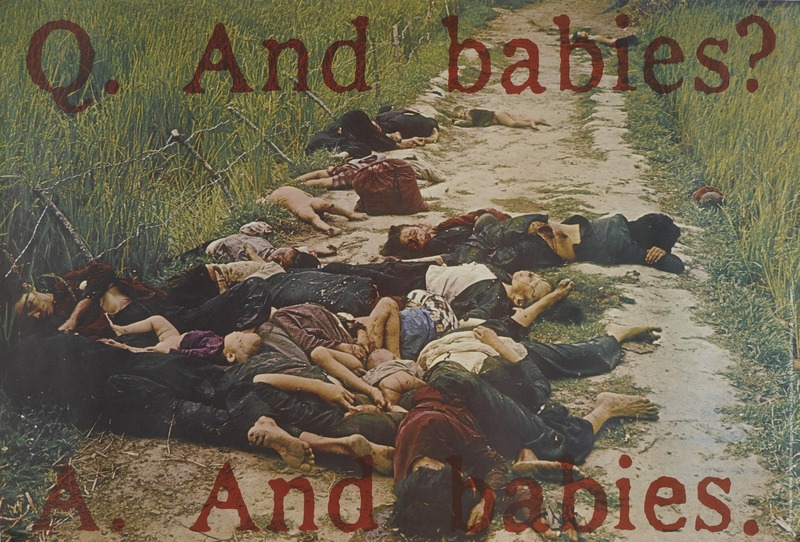 A: And Babies by Irving Petlin is a famous anti-Vietnam war poster and also one of the most disturbing wartime images ever created. The original photograph used for the poster was taken by the U.S. combat photographer, Ronald L. Haeberle at the My Lai Massacre in South Vietnam on March 16, 1968. The quote “Q: And Babies? A: And Babies” comes from an interview of a participant in the massacre, U.S. soldier Paul Meadlo by CBS news anchor Mike Wallace. The transcript in its entirety describes how innocent men, women, and children were shoved into a ravine and shot. In the interview, Meadlo himself admitted to killing at least fifty of the three hundred and seventy that he estimates were killed that day. The real number was five hundred and eighty. The day after the massacre, Meadlo stepped on a landmine, which blew off part of his leg. He believes that this was a punishment for his actions the day before. In 1969, the Art Workers Coalition or AWC decided to create a poster to protest the war in Vietnam and the Museum of Modern Art pledged to fund its distribution. But when the Board of Trustees, among them Nelson Rockefeller and the head of CBS at the time William S. Paley, saw the poster they went back on their promise. The picture of the piled dead bodies with the blood-red text made them squirm, so instead the New York City Lithographer’s Union took care of it and printed 50,000 copies of the poster. It was probably the most influential propaganda poster of all time, which makes sense because well, look at it. It’s the most horrifying picture ever. It brought the atrocities of war into people’s homes and made them deal with what was really happening overseas. The truth hurts.